I am a big fan of salmon in all forms. Everytime I see it on sale at the market I have to buy it. Last week it was so cold and nasty outside that I needed to cook something to keep me warm and make me feel good, so I decided to make these Salmon Rolls with Asparagus served over tomato sauce. I used my simple homemade tomato sauce , but if you want to use store bought to keep it easier, that’s okay too. This recipe was easy to make, elegant and delicious. I would recommend this dish for a dinner party. I loved it! Lay the salmon fillets on a cutting board and sprinkle with salt and pepper. In a small bowl whisk together the mayonaisse, mustard, parsley, thyme, onion powder , garlic powder and lime juice. Top each salmon fillet with 4 asparagus pieces. Roll the fillets and place seam-side down on a greased baking sheet. brush rolls with the mayo mixture and sprinkle with bread crumbs and parmesan cheese, pressing to adhere. Bake for about 25 minutes or until the salmon is cooked through. Serve over your favorite tomato sauce. I’ll be the first to comment. You know how much I love salmon. This looks great and easy to prepare. I will have to try this one. oh my…just that title makes me want to eat every bite of this! Gorgeous, gorgeous flavours that compliment my favourite fish too!! So simple and yummy! Great recipe Erica. 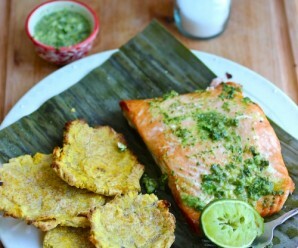 I have been needing some salmon recipes so I’m going to try this next week! I like that the salmon rolls are coated with mayo and mustard, cheese and breadcrumbs. It looks really elegant and delicious, Erica! Simply elegant, can’t wait to try it I love any kind of fish! This is such a pretty, elegant meal! 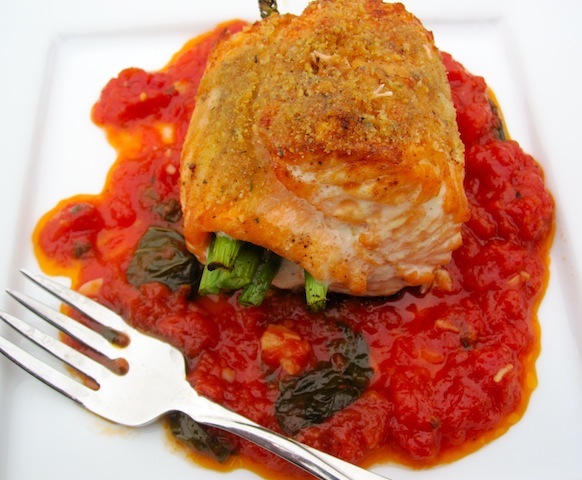 I love salmon too and it is especially delicious paired with asparagus! OH my, my. 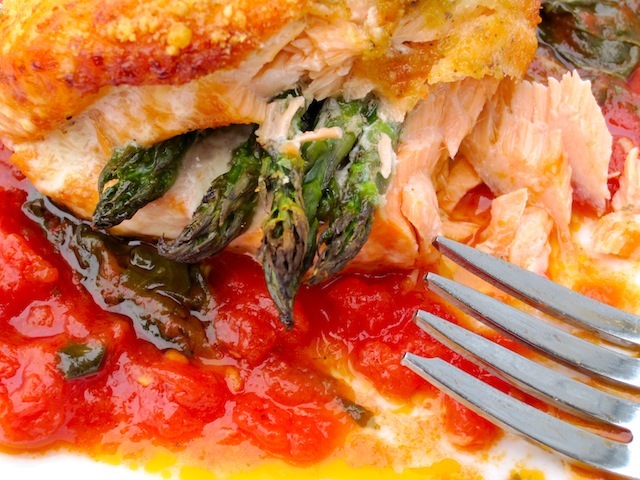 I think you have embraced two of my favorites: Salmon and Asparagus, magnificent! I love, love , love asparagus in any way, shape or form. And then add cheese? I want to have some now. 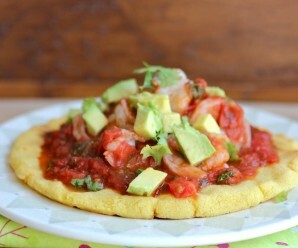 Will be adding this to my recipes to try list. Thanks for the new idea for some of my favs. Wow, this dish sounds and looks delicious! Thanks for sharing! This is such a great idea. A must try! What a great idea! I bet the asparagus is great with the salmon. Yummy. Amazing. I also love salmon and I am baking some fillets just now. Have never made salmon with a totamo sauce. This is something I should try. Such a healthy dish too, Erica! Salmon and asparagus are both so good for you and luckily, we like both in our house! Salmon is one of my favourite fish too. Great idea to make rolls – they do look very elegant, yum! Hope the weather is warming up a bit for you. Would never think of combinig salmon and tomatoes but this is absolutely lovely. OH Erica! This recipe looks so good and I bet it was fun to make too. Stumbled! What a sublime idea! Waw!! A georgous & ooh so festive salmon dish!! You know I am not a big big fan of salmon but I am a huge fan of tomato sauce and looking at the pic I really feel like devouring this dish. Oh my! I love salmon too, and this makes me love it even more! Yum, it looks fantastic, your photos are unbelievable! I am pretty much a salmon addict as well. If it’s on sale, you can bet that it is going in my cart. 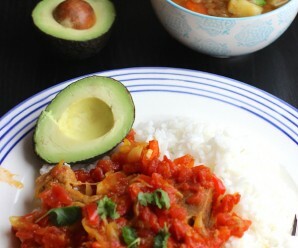 This looks like the perfect dinner to warm you up! Tomato sauce just makes everything better. 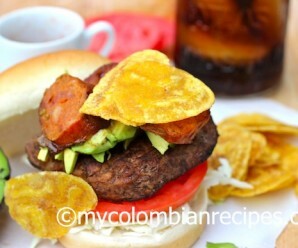 Este plato es extraordinario!, El sabor tiene que ser divino, con esa mezcla de ingredientes. Me gusta. I really need to eat more salmon, esp. if you keep showing me pretty ways to eat them. I am kind of stuck to Tilapia & do not get too many of other fishes too often. Thank you everyone!I truly appreciate your comments!